Promotional items for corporations, clubs and other groups (company or club colors can be coordinated with logos, either screened or embroidered). 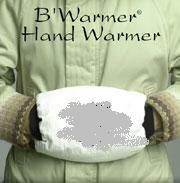 B' Warmer thermal products are designed for natural warmth and comfort. Made with a unique thermal insulating material that reflects back the user's own body heat -- provides more warmth and comfort than typical fleece products and other insulators of comparable thickness.